Nuclear-armed point defense anti-ballistic missile, an incredible high-acceleration weapon that would intercept incoming Soviet ICBMs in the atmosphere within 15 seconds of launch. Deployment limited by arms agreements and only 70 were briefly in service in 1975-1976. AKA: Sprint;W66. Status: Retired 1975. First Launch: 1965-01-01. Last Launch: 1975-04-30. Number: 78 . Payload: 450 kg (990 lb). Thrust: 3,000.00 kN (674,400 lbf). Gross mass: 3,400 kg (7,400 lb). Height: 8.23 m (27.00 ft). Diameter: 1.37 m (4.49 ft). Span: 1.37 m (4.49 ft). Apogee: 30 km (18 mi). Development of the Nike Zeus anti-ballistic missile in the 1950's indicated a problem. What about all those decoys the Soviets could deploy in space together with the real re-entry vehicles? What to do about the warheads that it missed? What was needed was a last-ditch missile of incredible acceleration that could hit incoming warheads in the few seconds after they entered the atmosphere and could be differentiated from the decoys. Martin Marietta received a development contract for the Sprint missile to meet this requirement in March 1963. Launches of Squirt experimental missiles to test the high-acceleration solid propellant technology began in 1964. The first Sprint launch was in November 1965, first intercept using the entire radar-guidance-missile system in December 1970. In May 1971, Martin Marietta was issued a contract for an improved Sprint II, with improved guidance, greater agility and improved reliability. Flight test of the basic Sprint concluded after 50 launches in December 1973. By that time arms limitation negotiations with the Soviet Union allowed each side only one ABM site with 100 missiles. Accordingly, on 1 October 1975, a single Safeguard ABM site with 30 Spartan and 70 Sprint missiles went on-line in North Dakota. It was ordered deactivated by the US Congress the next day, and closed six-months later, ending America's first thirty-year effort to obtain a ballistic missile defense system. Sprint II never reached the flight-test stage. The Sprint missile, cone-shaped like the reentry vehicles it was intercepting, had two solid-propellant rocket stages. The missile was popped out of its silo by a cold gas generator; then the first stage ignited, accelerating the missile at more than 100G's. Seconds later the missile reached Mach 10, protected by the same ablative nose-cone technology used on the re-entry vehicles it was intercepting. Phased-array radars and high-speed computer processing allowed the warhead to be tracked, steering commands for the Sprint to be calculated, and uplinked to the missile via a radio connection of the frequency and power to be received through the ionized missile exhaust and plasma sheath surrounding the missile. The missile steered itself using fluid injection in the first stage and small vanes on the second stage. On command the missile's 1 kT W-66 nuclear warhead was ignited, generating a neutron flux that disabled the fissile core of the enemy missile. Entire engagement time � from launch to intercept � was 15 seconds maximum. Development Cost $: 530.000 million. Recurring Price $: 6.549 million in 1969 dollars. Flyaway Unit Cost 1985$: 2.000 million in 1969 dollars. Maximum range: 47 km (29 mi). Number Standard Warheads: 1. Standard warhead: W66. Warhead yield: 1,000 KT. Boost Propulsion: Solid rocket. Initial Operational Capability: 1972. Total Number Built: 122. Total Development Built: 52. Total Production Built: 70. Floor: 1,500 m (4,900 ft). The Sprint was a nuclear-armed point defense ABM (Anti-Ballistic Missile), which was developed in the 1960s as one component of an American defense system against Soviet ICBMs. It was operational for a very short time in 1975. In the late 1950s, the U.S. Army began the development of the XLIM-49A Nike Zeus B exo-atmospheric anti-ballistic missile. While it was definitely desirable to intercept ICBMs at the highest possible altitude to minimize the contamination effects of the interceptor missile's thermonuclear warhead, it was also clear that a terminal defense missile would be needed to catch those reentry vehicles which slipped past the "first line" of defense. After studies in the early 1960s showed that a very-high speed interceptor missile was feasable, Martin Marietta received a development contract for the Sprint missile in March 1963. Component testing began in early 1964, including launches of Squirt experimental missiles. The first Sprint launch occurred in November 1965. The only Prototype MSR was at Kwajalein, which was operational for supporting Sprint-Spartan launches in 1970. There was never an MSR at White Sands. Tracking of the Sprint there was by a missile tracking radar that used modified Nike Hercules tracking radar mounts and a radar transmitter-receiver located in a building under a tower. This was the same missile tracking radar arrangement for the Zeus. The cone-shaped Sprint missile was powered by a two-stage solid-propellant rocket motor. The motor ignited after the missile had been ejected from its silo by gas pressure, and accelerated the Sprint with more than 100 g. Within seconds, the missile reached a speed of Mach 10+, and the extreme thermodynamic heating demanded sophisticated ablative shielding (the nose was already glowing red-hot less than a second after launch). The Sprint was guided to the target by radio-commands from the ground control system, which used high-speed phased-array MSRs to track the incoming ICBM reentry vehicles. The command uplink had to be powerful enough to work through the exhaust plume and the plasma sheathe around the missile body. Sprint's first stage used fluid-injection jet vanes for control, and the second stage had four small moving fins. The missile was armed with a 1 kT W-66 enhanced radiation thermonuclear warhead, which was detonated by ground command. It destroyed the target's warhead not only with the nuclear blast, but mainly with the very high neutron flux. The whole flight time for an intercept was expected to be not more than 15 seconds. 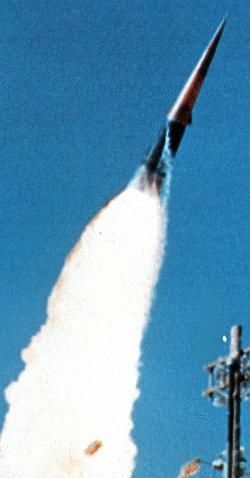 Full scale testing of the Sprint and the MSR began in mid-1970, and the first successful intercept of a reentry vehicle by a Sprint occurred in December 1970. A total of about 50 flight tests, the majority being successful, were conducted between this date and December 1973. During the 1960s, the initially planned nation-wide ABM system had been reduced in scope for cost reasons (see also article about LIM-49 Spartan). The final plan, introduced in 1969, was called Safeguard, an ABM system to defend only SAC's ICBM bases, and not the cities of the United States. The SALT I treaty of 1972, and a 1974 addendum, limited Safeguard to only one site with 100 ABMs. On 1 October 1975, the U.S.'s one and only Safeguard ABM site became operational with 30 LIM-49A Spartan and 70 Sprint missiles. However, because the very limited defense offered by a single ABM site did not warrant the costs, the site was deactivated by Congress the next day. About 150 Sprint missiles were built for flight tests and operational deployment. In May 1971, Martin Marietta had received a contract for an improved missile called Sprint II. This variant would have had an improved guidance system, higher agility and improved reliability, but the Sprint II program did apparently not result in any flight tests. Studies of nuclear armed ABMs were finally ended in 1983. Designation Note: Several sources (including ) explicitly say that Sprint never received a formal missile designation (LIM-nnn). However, it is possible that one of the designations XLIM-99A and XLIM-100A, which were reserved in October 1972, was in fact planned for Sprint (but not taken up for unknown reasons). Squirt American anti-ballistic test vehicle. HIBEX American anti-ballistic missile. Hibex was a 5.2 m long test vehicle used by the Army in a series of research experiments investigating high performance missile boosters. During mid-1960's experimental flights at White Sands, Hibex was fired successfully from underground cells and above-ground launch sites. Upstage American sounding rocket. Sprint test vehicle. Family: anti-ballistic. Country: USA. Launch Sites: White Sands, Kwajalein, White Sands LC37, White Sands LC50, Kwajalein Meck, Kwajalein IL. Stages: X-265, X-271. Agency: Martin. Bibliography: 2. 1964 - . Launch Site: White Sands. Launch Complex: White Sands LC37. LV Family: Sprint ABM. Launch Vehicle: Squirt. Nation: USA. Agency: US Army. Apogee: 3.00 km (1.80 mi). 1964? - . Launch Site: White Sands. Launch Complex: White Sands LC37. LV Family: Sprint ABM. Launch Vehicle: Squirt. 1964 March 17 - . Launch Site: White Sands. Launch Complex: White Sands LC37. LV Family: Sprint ABM. Launch Vehicle: Squirt. 1965 - . Launch Site: White Sands. Launch Complex: White Sands LC37. Launch Vehicle: Sprint ABM. 1965? - . Launch Site: White Sands. Launch Complex: White Sands LC37. LV Family: Sprint ABM. Launch Vehicle: Squirt. Squirt MTV-4 - . Nation: USA. Agency: US Army. Apogee: 3.00 km (1.80 mi). 1965 February 25 - . Launch Site: White Sands. LV Family: Sprint ABM. Launch Vehicle: HIBEX. Test mission - . Nation: USA. Agency: DARPA, US Army. Apogee: 20 km (12 mi). 1965 May 1 - . Launch Site: White Sands. LV Family: Sprint ABM. Launch Vehicle: HIBEX. 1965 May 26 - . Launch Site: White Sands. Launch Complex: White Sands LC50. Launch Vehicle: Sprint ABM. Test mission - . Nation: USA. Agency: US Army. Apogee: 3.00 km (1.80 mi). 1965 June 9 - . Launch Site: White Sands. Launch Complex: White Sands LC37. Launch Vehicle: Sprint ABM. Nation: USA. Agency: US Army. Type: ABM. Apogee: 3.00 km (1.80 mi). 1965 July 1 - . Launch Site: White Sands. LV Family: Sprint ABM. Launch Vehicle: HIBEX. Nation: USA. Agency: DARPA, US Army. Apogee: 20 km (12 mi). 1965 September 1 - . Launch Site: White Sands. LV Family: Sprint ABM. Launch Vehicle: HIBEX. 1965 October 28 - . Launch Site: White Sands. Launch Complex: White Sands LC50. LV Family: Sprint ABM. Launch Vehicle: HIBEX. HIBEX test - . Nation: USA. Agency: US Army. Apogee: 0 km (0 mi). 1965 November 15 - . Launch Site: White Sands. Launch Complex: White Sands LC50. Launch Vehicle: Sprint ABM. 1965 December 1 - . Launch Site: White Sands. LV Family: Sprint ABM. Launch Vehicle: HIBEX. 1966 January 13 - . Launch Site: White Sands. LV Family: Sprint ABM. Launch Vehicle: HIBEX. 10 test - . Nation: USA. Agency: DARPA, US Army. Apogee: 20 km (12 mi). 1966 January 25 - . Launch Site: White Sands. Launch Complex: White Sands LC50. Launch Vehicle: Sprint ABM. FAILURE: Failure. Test mission - . Nation: USA. Agency: US Army. Apogee: 0 km (0 mi). 1966 May 3 - . Launch Site: White Sands. Launch Complex: White Sands LC50. Launch Vehicle: Sprint ABM. FAILURE: Failure. 1966 August 2 - . Launch Site: White Sands. Launch Complex: White Sands LC50. Launch Vehicle: Sprint ABM. FAILURE: Failure. 1966 November 3 - . Launch Site: White Sands. Launch Complex: White Sands LC50. Launch Vehicle: Sprint ABM. FAILURE: Failure. 1967 April 18 - . Launch Site: White Sands. Launch Complex: White Sands LC50. Launch Vehicle: Sprint ABM. FAILURE: Failure. Test mission - . Nation: USA. Agency: US Army. Apogee: 1.00 km (0.60 mi). 1967 May 23 - . Launch Site: White Sands. Launch Complex: White Sands LC50. Launch Vehicle: Sprint ABM. FAILURE: Failure. 1967 July 18 - . Launch Site: White Sands. Launch Complex: White Sands LC50. Launch Vehicle: Sprint ABM. Test mission - . Nation: USA. Agency: US Army. Apogee: 2.00 km (1.20 mi). 1967 August 8 - . Launch Site: White Sands. Launch Complex: White Sands LC50. Launch Vehicle: Sprint ABM. 1967 September 19 - . Launch Site: White Sands. Launch Complex: White Sands LC50. Launch Vehicle: Sprint ABM. FAILURE: Failure. 1967 October 10 - . Launch Site: White Sands. Launch Complex: White Sands LC50. Launch Vehicle: Sprint ABM. Test mission - . Nation: USA. Agency: US Army. Apogee: 6.00 km (3.70 mi). 1967 October 31 - . Launch Site: White Sands. Launch Complex: White Sands LC50. Launch Vehicle: Sprint ABM. 1967 November 20 - . Launch Site: White Sands. Launch Complex: White Sands LC50. Launch Vehicle: Sprint ABM. FAILURE: Failure. 1967 December 11 - . Launch Site: White Sands. Launch Complex: White Sands LC50. Launch Vehicle: Sprint ABM. 1968 February 5 - . Launch Site: White Sands. Launch Complex: White Sands LC50. Launch Vehicle: Sprint ABM. FAILURE: Failure. 1968 February 26 - . Launch Site: White Sands. Launch Complex: White Sands LC50. Launch Vehicle: Sprint ABM. 1968 March 25 - . Launch Site: White Sands. Launch Complex: White Sands LC50. Launch Vehicle: Sprint ABM. FAILURE: Failure. 1968 April 22 - . Launch Site: White Sands. Launch Complex: White Sands LC50. Launch Vehicle: Sprint ABM. FAILURE: Failure. 1968 June 27 - . Launch Site: White Sands. Launch Complex: White Sands LC50. Launch Vehicle: Sprint ABM. 1968 July 29 - . Launch Site: White Sands. Launch Complex: White Sands LC50. Launch Vehicle: Sprint ABM. 1968 August 22 - . Launch Site: White Sands. Launch Complex: White Sands LC50. Launch Vehicle: Sprint ABM. 1968 September 9 - . Launch Site: White Sands. Launch Complex: White Sands LC50. Launch Vehicle: Sprint ABM. 1968 October 8 - . Launch Site: White Sands. Launch Complex: White Sands LC50. Launch Vehicle: Sprint ABM. 1968 October 28 - . Launch Site: White Sands. Launch Complex: White Sands LC50. Launch Vehicle: Sprint ABM. 1968 December 2 - . Launch Site: White Sands. Launch Complex: White Sands LC50. Launch Vehicle: Sprint ABM. FAILURE: Failure. 1969 February 10 - . Launch Site: White Sands. Launch Complex: White Sands LC50. Launch Vehicle: Sprint ABM. 1969 March 17 - . Launch Site: White Sands. Launch Complex: White Sands LC50. Launch Vehicle: Sprint ABM. FAILURE: Failure. 1969 April 21 - . Launch Site: White Sands. Launch Complex: White Sands LC50. Launch Vehicle: Sprint ABM. 1969 May 26 - . Launch Site: White Sands. Launch Complex: White Sands LC50. Launch Vehicle: Sprint ABM. 1969 June 23 - . Launch Site: White Sands. Launch Complex: White Sands LC50. Launch Vehicle: Sprint ABM. 1969 July 22 - . Launch Site: White Sands. Launch Complex: White Sands LC50. Launch Vehicle: Sprint ABM. Test mission - . Nation: USA. Agency: US Army. Apogee: 10 km (6 mi). 1969 September 15 - . Launch Site: White Sands. Launch Complex: White Sands LC50. Launch Vehicle: Sprint ABM. 1969 October 6 - . Launch Site: White Sands. Launch Complex: White Sands LC50. Launch Vehicle: Sprint ABM. FAILURE: Failure. 1969 October 23 - . Launch Site: White Sands. Launch Complex: White Sands LC50. Launch Vehicle: Sprint ABM. 1969 November 6 - . Launch Site: White Sands. Launch Complex: White Sands LC50. Launch Vehicle: Sprint ABM. FAILURE: Failure. 1969 December 1 - . Launch Site: White Sands. Launch Complex: White Sands LC50. Launch Vehicle: Sprint ABM. FAILURE: Failure. 1970 March 17 - . Launch Site: White Sands. Launch Complex: White Sands LC50. Launch Vehicle: Sprint ABM. FAILURE: Failure. 1970 May 28 - . Launch Site: White Sands. Launch Complex: White Sands LC50. Launch Vehicle: Sprint ABM. 1970 June 8 - . Launch Site: White Sands. Launch Complex: White Sands LC50. Launch Vehicle: Sprint ABM. 1970 June 29 - . Launch Site: White Sands. Launch Complex: White Sands LC50. Launch Vehicle: Sprint ABM. 1970 August 12 - . Launch Site: White Sands. Launch Complex: White Sands LC50. Launch Vehicle: Sprint ABM. 1970 October 28 - . Launch Site: Kwajalein. Launch Complex: Kwajalein Meck. Launch Vehicle: Sprint ABM. FAILURE: Failure. Safeguard M1-9 Interceptor mission - . Nation: USA. Agency: US Army. Apogee: 0 km (0 mi). 1970 December 4 - . Launch Site: Kwajalein. Launch Complex: Kwajalein Meck. Launch Vehicle: Sprint ABM. Safeguard M1-9A Interceptor mission - . Nation: USA. Agency: US Army. Apogee: 10 km (6 mi). 1970 December 23 - . Launch Site: Kwajalein. Launch Complex: Kwajalein Meck. Launch Vehicle: Sprint ABM. Safeguard M1-12 Interceptor mission - . Nation: USA. Agency: US Army. Apogee: 10 km (6 mi). 1971 February 23 - . Launch Site: Kwajalein. Launch Complex: Kwajalein Meck. Launch Vehicle: Sprint ABM. Safeguard M1-28 Interceptor mission - . Nation: USA. Agency: US Army. Apogee: 10 km (6 mi). 1971 March 17 - . Launch Site: Kwajalein. Launch Complex: Kwajalein Meck. Launch Vehicle: Sprint ABM. SAFEGUARD M1-13 Interceptor mission - . Nation: USA. Agency: US Army. Apogee: 10 km (6 mi). 1971 May 7 - . Launch Site: Kwajalein. Launch Complex: Kwajalein Meck. Launch Vehicle: Sprint ABM. Safeguard M1-8 Interceptor mission - . Nation: USA. Agency: US Army. Apogee: 10 km (6 mi). 1971 October 7 - . Launch Site: Kwajalein. Launch Complex: Kwajalein Meck. Launch Vehicle: Sprint ABM. Safeguard M2-2 Interceptor mission - . Nation: USA. Agency: US Army. Apogee: 5.00 km (3.10 mi). 1971 November 1 - . Launch Site: White Sands. LV Family: Sprint ABM. Launch Vehicle: Upstage. 1971 November 10 - . Launch Site: Kwajalein. Launch Complex: Kwajalein Meck. Launch Vehicle: Sprint ABM. Safeguard M2-8 Interceptor mission - . Nation: USA. Agency: US Army. Apogee: 5.00 km (3.10 mi). Safeguard M2-5 Interceptor mission - . Nation: USA. Agency: US Army. Apogee: 5.00 km (3.10 mi). 1972 January 6 - . Launch Site: Kwajalein. Launch Complex: Kwajalein Meck. Launch Vehicle: Sprint ABM. Safeguard M2-4 Interceptor mission - . Nation: USA. Agency: US Army. Apogee: 5.00 km (3.10 mi). 1972 March 1 - . Launch Site: White Sands. LV Family: Sprint ABM. Launch Vehicle: Upstage. 1972 March 16 - . Launch Site: Kwajalein. Launch Complex: Kwajalein IL. Launch Vehicle: Sprint ABM. Safeguard M2-7 Interceptor mission - . Nation: USA. Agency: US Army. Apogee: 5.00 km (3.10 mi). 1972 May 1 - . Launch Site: White Sands. LV Family: Sprint ABM. Launch Vehicle: Upstage. 1972 May 5 - . Launch Site: Kwajalein. Launch Complex: Kwajalein Meck. Launch Vehicle: Sprint ABM. Safeguard M2-11 Interceptor mission - . Nation: USA. Agency: US Army. Apogee: 5.00 km (3.10 mi). 1972 May 24 - . Launch Site: Kwajalein. Launch Complex: Kwajalein IL. Launch Vehicle: Sprint ABM. Safeguard M2-10 Interceptor mission - . Nation: USA. Agency: US Army. Apogee: 5.00 km (3.10 mi). 1972 July 15 - . Launch Site: Kwajalein. Launch Complex: Kwajalein Meck. Launch Vehicle: Sprint ABM. Safeguard M2-15 Interceptor mission - . Nation: USA. Agency: US Army. Apogee: 26 km (16 mi). 1972 August 1 - . Launch Site: White Sands. LV Family: Sprint ABM. Launch Vehicle: Upstage. 1972 August 17 - . Launch Site: Kwajalein. Launch Complex: Kwajalein Meck. Launch Vehicle: Sprint ABM. FAILURE: Failure. Safeguard M2-42 Interceptor mission - . Nation: USA. Agency: US Army. Apogee: 0 km (0 mi). 1972 August 24 - . Launch Site: Kwajalein. Launch Complex: Kwajalein Meck. Launch Vehicle: Sprint ABM. Safeguard M2-42A Interceptor mission - . Nation: USA. Agency: US Army. Apogee: 10 km (6 mi). 1972 October 11 - . Launch Site: Kwajalein. Launch Complex: Kwajalein Meck. Launch Vehicle: Sprint ABM. FAILURE: Failure. Safeguard M2-14 Interceptor mission - . Nation: USA. Agency: US Army. Apogee: 1.00 km (0.60 mi). 1972 December 5 - . Launch Site: Kwajalein. Launch Complex: Kwajalein IL. Launch Vehicle: Sprint ABM. SAFEGUARD M2-21 Interceptor mission - . Nation: USA. Agency: US Army. Apogee: 10 km (6 mi). 1972 December 8 - . Launch Site: Kwajalein. Launch Complex: Kwajalein Meck. Launch Vehicle: Sprint ABM. 1973 February 22 - . Launch Site: Kwajalein. Launch Complex: Kwajalein Meck. Launch Vehicle: Sprint ABM. SAFEGUARD M2-41 Interceptor mission - . Nation: USA. Agency: US Army. Apogee: 10 km (6 mi). Safeguard TRM-97 Interceptor mission - . Nation: USA. Agency: US Army. Apogee: 10 km (6 mi). 1973 June 7 - . Launch Site: Kwajalein. Launch Complex: Kwajalein Meck. Launch Vehicle: Sprint ABM. Safeguard M2-22 Interceptor mission - . Nation: USA. Agency: US Army. Apogee: 4.00 km (2.40 mi). 1973 July 20 - . Launch Site: Kwajalein. Launch Complex: Kwajalein IL. Launch Vehicle: Sprint ABM. Safeguard M2-18 Interceptor mission - . Nation: USA. Agency: US Army. Apogee: 10 km (6 mi). 1973 October 5 - . Launch Site: Kwajalein. Launch Complex: Kwajalein Meck. Launch Vehicle: Sprint ABM. Safeguard M2-27 Interceptor mission - . Nation: USA. Agency: US Army. Apogee: 10 km (6 mi). 1973 November 2 - . Launch Site: Kwajalein. Launch Complex: Kwajalein IL. Launch Vehicle: Sprint ABM. Safeguard M2-38 Interceptor mission - . Nation: USA. Agency: US Army. Apogee: 10 km (6 mi). 1973 November 29 - . Launch Site: Kwajalein. Launch Complex: Kwajalein IL. Launch Vehicle: Sprint ABM. Safeguard M2-25 Interceptor mission - . Nation: USA. Agency: US Army. Apogee: 10 km (6 mi). 1974 February 14 - . Launch Site: Kwajalein. Launch Complex: Kwajalein Meck. Launch Vehicle: Sprint ABM. Safeguard M2-48 Interceptor mission - . Nation: USA. Agency: US Army. Apogee: 10 km (6 mi). 1974 April 16 - . Launch Site: Kwajalein. Launch Complex: Kwajalein Meck. Launch Vehicle: Sprint ABM. Safeguard M2-148 Interceptor mission - . Nation: USA. Agency: US Army. Apogee: 10 km (6 mi). 1974 August 2 - . Launch Site: Kwajalein. Launch Complex: Kwajalein Meck. Launch Vehicle: Sprint ABM. Safeguard M2-248 Interceptor mission - . Nation: USA. Agency: US Army. Apogee: 10 km (6 mi). 1974 October 2 - . Launch Site: Kwajalein. Launch Complex: Kwajalein Meck. Launch Vehicle: Sprint ABM. Safeguard M2-348 Interceptor mission - . Nation: USA. Agency: US Army. Apogee: 4.00 km (2.40 mi). 1974 October 17 - . Launch Site: Kwajalein. Launch Complex: Kwajalein Meck. Launch Vehicle: Sprint ABM. Safeguard M2-448 Interceptor mission - . Nation: USA. Agency: US Army. Apogee: 25 km (15 mi). 1975 April 30 - . Launch Site: Kwajalein. Launch Complex: Kwajalein Meck. Launch Vehicle: Sprint ABM. Safeguard M2-548 Interceptor mission - . Nation: USA. Agency: US Army. Apogee: 4.00 km (2.40 mi).